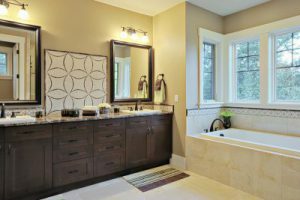 Are you ready to better enjoy the bathroom in your Allen, Texas, house? If so, allow the reliable experts at Star Home Remodeling to complete a stunning bathroom makeover that will enhance both style and functionality. And, as a full-service home remodeling company, we can complete large-scale projects, such as increasing the square footage of your bathroom or building a custom walk-in closet. When you partner with Star Home Remodeling for your bathroom makeover, you can look forward to working with experienced professionals who are committed to providing first-class services. In fact, we’ve built a reputation on being an upfront and honest company that’s dedicated to educating our clients about all products and services available. Furthermore, we are always transparent about costs and avoid pushy sales tactics that could make you feel pressured or stressed. To learn more about our streamlined bathroom makeover process, contact Star Home Remodeling today. One of our experienced and friendly specialists will be delighted to answer any questions you have and speak with you further about the fantastic products and services we offer to homeowners throughout the Allen, TX, area.